We are very pleased your Coach has chosen to play in our Tournaments. In an effort to allow teams to play in more Tournaments, we charge each Team a very low Tournament Fee. To offset this low Tournament fee we do charge an admission fee to adults and children over 15. We sell two types of wristbands - a Daily wristband which is $8.00 and a Weekend wristband which is $12.00. You MUST have a wristband to enter the Tournament. Upon entering the Tournament and purchasing your wristband, our staff will attach the wristband to your arm or an article of clothing. WE RECOMMEND PLACING THE WRISTBAND ON YOUR WRIST. These wristbands are made of nylon and will not come apart when they are wet. If you purchase a Weekend wristband, you MUST present your wristband to enter the second day of the Tournament. If you misplace or lose your wristband(s), you will have to purchase a Daily wristband(s) to enter the Tournament. 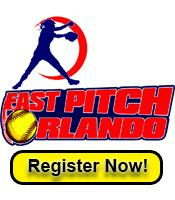 Fast Pitch Orlando reserves the right to take video and still photos at all Tournaments hosted by Fast Pitch Orlando. By attending these events, you agree that your name and childs name, image, and/or likeness may be used by Fast Pitch Orlando for media and promotions arising out of and related to these events and that the materials produced by Fast Pitch Orlando or its affiliates is the sole property of Fast Pitch Orlando.